Women serving the main iftar meal at Masjid Al-Hikmah’s public iftar on July 21, 2013. Photo by Anne Noyes Saini. Astorians often associate iftar—the meal at sundown that breaks the Ramadan fast—with Steinway Street’s Middle Eastern restaurants and hookah cafes. On many evenings when Ramadan—the month for contemplation and purification, which in 2013 falls in July and early August—is observed by Muslims, Steinway is bustling with families and groups of friends gathering to share that evening meal. 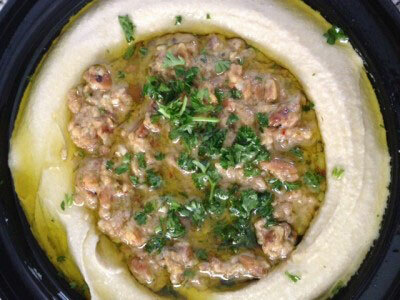 Hummus Jerusalem at Duzan on Steinway Street in Astoria. Last year I enjoyed a delicious iftar meal with friends at hummus- and shawarma-specialist Duzan. Although they had not yet broken their own fast, Duzan’s owners were incredibly attentive and friendly hosts. But this year I wanted to venture beyond Steinway. So I was thrilled to learn about the public iftar meals at Astoria’s Indonesian mosque, Masjid Al-Hikmah. On Saturday and Sunday evenings during Ramadan, the mosque opens its courtyard to the neighborhood and serves a free iftar meal to all who come, regardless of their religious beliefs. The iftar begins at approximately 8:00 p.m. (sundown) with light snacks to break the day-long fast. After brief prayers inside the mosque, a generous meal is served buffet-style in the outdoor courtyard. Belado telur at Masjid Al-Hikmah’s public iftar on July 21, 2013. Photo by Anne Noyes Saini. 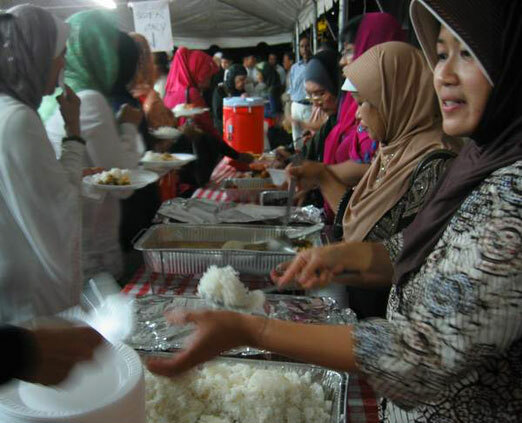 Each meal, sponsored by a different Indonesian organization in New York City, features dishes (prepared by mosque volunteers) representing a different region of Indonesia. The iftar I attended on a steamy Sunday evening in late July (sponsored by Cakra, a Javanese community group) featured the tangy-sweet food of Central Java. One volunteer also described the West Javanese meal from the prior night’s iftar and assured me that dishes from her native island of Sulawesi—and other Indonesian islands, too—were planned for the remaining iftars. Pisang molen at Masjid Al-Hikmah’s public iftar on July 21, 2013. Photo by Anne Noyes Saini. Our Central Javanese meal included dishes like empal goring (seasoned fried beef), sayur asem (a mildly funky, tamarind-based soup with jackfruit and vegetables), and belado telur (hard-boiled eggs cooked with fiery red sambal). 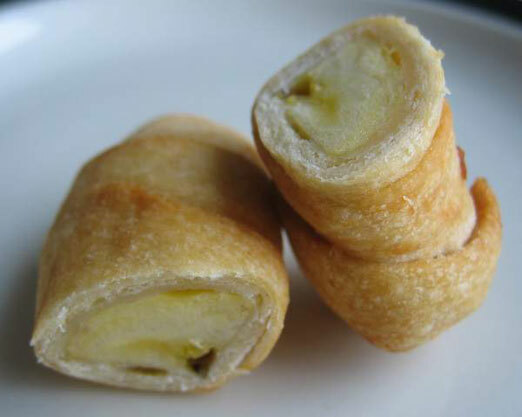 Before the meal, we enjoyed sweets (fresh dates and kolak—banana, sweet potatoes, and tapioca pearls in coconut milk) and light snacks, like pisang molen (banana wrapped in dough and fried) and lemper (glutinous rice and chicken steamed in a banana leaf). See photos of all the dishes at Masjid Al-Hikmah’s iftar at this link. The atmosphere at the mosque was welcoming and festive. As the sun set, the crowd flowed toward the tables of food, where there were separate lines for men and women. Despite the hustle for food after a long day of fasting, several people stopped to make sure we had plenty to eat. It was a lovely—and delicious—way to pass a warm summer evening with fellow New Yorkers. 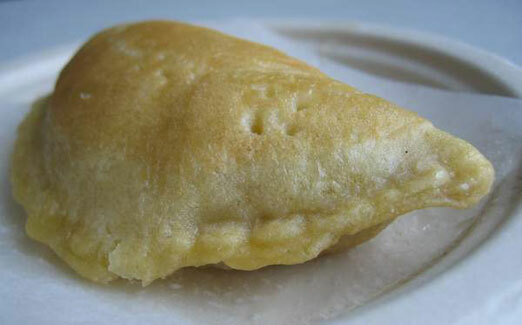 Katayef from Al-Sham Sweets. Photo by Anne Noyes Saini. Elsewhere in Astoria, during Ramadan, you can enjoy iftar meals from many other corners of the world. Some Astoria restaurants simply set out plates of dates—the traditional way to break the fast—for diners who arrive at sundown (approximately 8:25 p.m. between July 8 and August 7). Katayef interior from Al-Sham Sweets. Photo by Anne Noyes Saini. Others feature special dishes for the evening iftar meal. 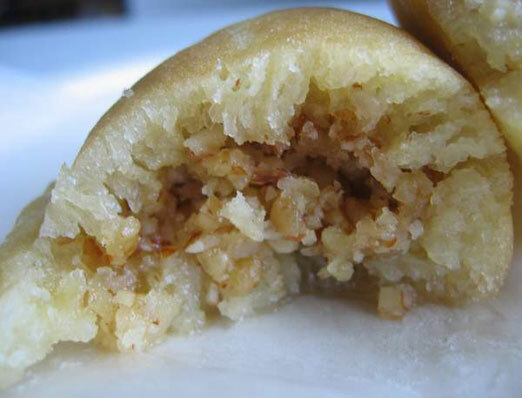 At Al-Sham Sweets, katayef—a pillowy, honey-soaked semolina pastry stuffed with walnuts or cheese—is sold only during Ramadan. And La Shish’s grilled lamb, normally available only on Friday nights, is on the menu every evening during Ramadan. A few neighborhood restaurants even offer iftar buffets and prix-fixe meals (e.g., El Omda’s six-course Egyptian iftar is available every night for $25—reservations recommended) or special discounts (e.g., Turkish sweets maker Gulluoglu offers $5 off online purchases over $20). Iftar box from Aladdin. Photo by Anne Noyes Saini. 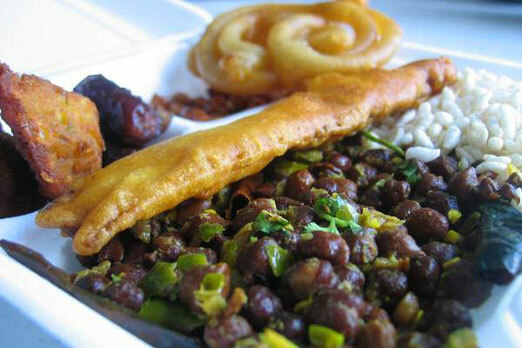 The boxes ($5/each) include several fried snacks and sweets, which are popular for initially breaking the fast: piazu (a tasty red-lentil fritter stuffed with onions and spices), beguni (battered and deep-fried strips of eggplant), two dates, and zilapi (similar to Indian jalebi—sugar-soaked, fried dough). You also get a large serving of chana bhuna (spicy black chickpeas sautéed with onion, green chilies, and spices), a few slices of cucumber, and muri (puffed rice). Aladdin’s buffet includes roughly a dozen other dishes ($2/small container; $5/medium container): biryanis (usually goat or chicken), kababs, khichuri (stewed rice and lentils), and chotpotti (stewed chickpeas and potato, slices of hard-boiled egg, and onion seasoned with tangy tamarind and chaat spices—a popular Bangladeshi street food), as well as fried snacks, like aloo chop and samosa, and sweet zilapi, sold by the pound ($7). Just a few blocks away, you can break the fast with a traditional Bosnian meal at Cevabdzinica Sarajevo. 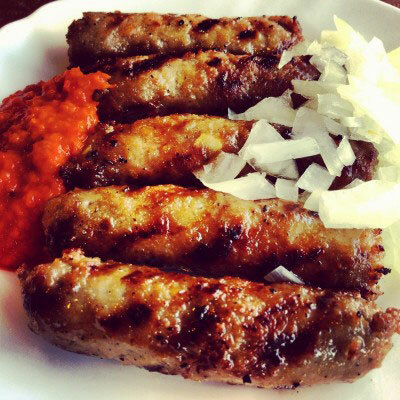 Try the cevapi (spicy, minced-meat kebabs that like elongated meatballs), burek (filo pastries stuffed with vegetables, cheese, or meat), cabbage rolls stuffed with meat and rice, and several Balkan sweets. During Ramadan, Cevabdzinica’s cozy dining room can fill up quickly at sundown. 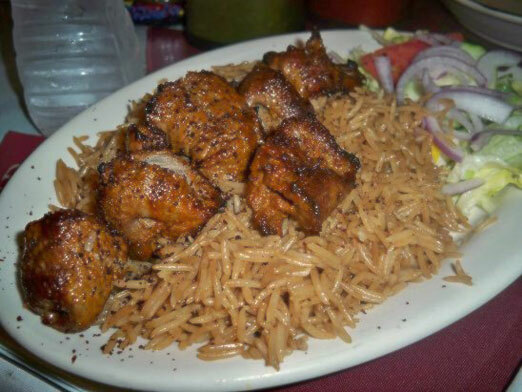 Be sure to call ahead to place your order for take-away—or arrive by 8:00 p.m.
Or head to Ditmars for an iftar meal at one of New York City’s few Afghan restaurants, Balkh Shish Kabab House. The Persian- and Central Asian-influenced food of northern Afghanistan’s Balkh Province dominates the menu here. Marinated lamb dishes and grilled kababs, biryanis (rice roasted with spiced meat or vegetables)—especially the Kabli Palow (arguably Afghanistan’s national dish), and aushack (scallion-filled, boiled dumplings eaten with yogurt and tomato sauces) are all good options. No matter where you go and what cuisines you try for iftar, come with an open mind and an empty stomach. That’s how we roll in Astoria. Thanks to Anne (and Joe DiStefano) for publicizing the iftars, and the fact that non-Muslims could attend. I had a wonderful time at Masjid Al-Hikmah’s iftar on August 3rd. The food was absolutely exceptional and the people were so friendly. Correction! This weekend (3-4 Aug.) the public iftars at Masjid Al-Hikmah will again be serving a mix of regional Indonesian cuisines. Rumor has it, spicy fare from Sumatra may be part of the mix! This weekend (27-28 July) the iftars will serve a mix of regional cuisines (a “pot luck”! ); next weekend (3-4 Aug), look for cooking from Sulawesi (spec. the city of Makassar). Great piece, Anne! 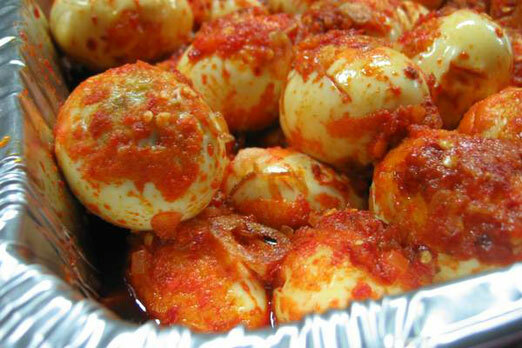 I LOVE belado telur (and that photo makes me salivate). Perhaps I need a visit to Astoria. Immediately. Shamsi, it was entirely my pleasure to join the iftar at Masjid Al-Hikmah … ad that was exactly the feeling I had while I was there with everyone! Thanks for covering the Iftar at Masjid Al-Hikmah. We are to all members of New York community; Muslims and non Muslims. Come and join us!